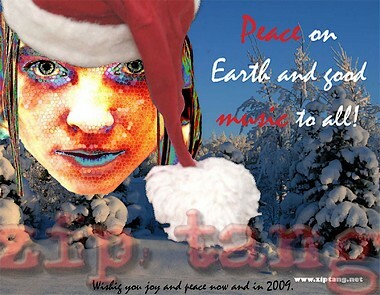 BIG NEWS fans and friends - Zip Tang will live on! Meet and welcome our new bass player Andrew Bunk! 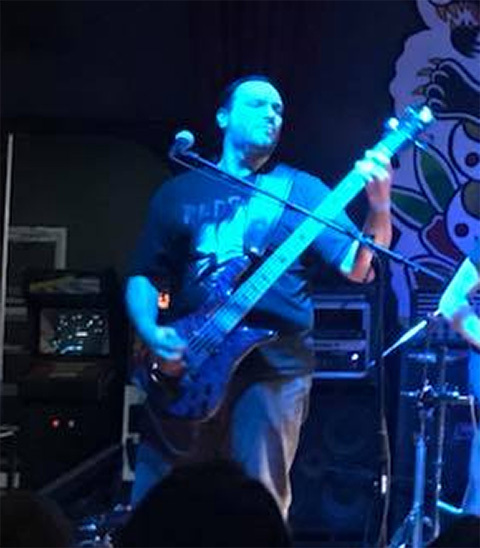 After many months of uncertainty about our future and the daunting task of trying to find a local high caliber player into our eclectic flavor of prog, Andrew came in to audition at ZiTi studio and just about nailed four of our most technically challenging songs. Much like our drummer Fred Faller's audition 15 years ago, after the first couple of songs we knew we had found our new bassist. We're very excited and have a new shot of enthusiasm to resume development of our new concept album, and to get out and play live again with the high energy and solid feel Andrew's style gives our old and new music. In the summer of 1988, Andy's friends needed someone to play bass and they happened to have a bass he could borrow. He gave it a shot, and 30 years later he's still going strong! After spending his formative years banging out all kinds of metal from thrash to glam, his musical influences began to expand and eventually led him to writing, recording and performing with numerous original and cover bands in both Chicago and NYC, including Profile, Braindance, Backstage Pass, X-Factor, Divinity Compromised and Silent Lucidity. He has played many of Chicago's best venues in addition to touring nationally including the prestigious ProgPower USA festival. He is currently an endorsing artist for the legendary Spector Bass company. With a heavy heart we are sad to announce that Zip Tang is now a duo. After 15 years and 5 CDs, our bassist, and resident sommelier, Richard Wolfe, has decided it is time to step away from the band. We have nothing but fond memories of our time together and we wish him all the best. While Doc's departure leaves a huge hole in the band, Zip Tang is far from being done. We have a lot of new material for our 6th album that we are determined to finish. Over the last couple of months, our good friend Marc Piane has been kind enough to jump in with his more-jazzy style of bass playing and composition skills. Unfortunately, Marc is also an in-demand player with a very full calendar making it difficult for him to rehearse regularly. So with Marc's support, we are actively seeking a bassist who digs our vibe and is interested in co-creating the next phase of Zip Tang II. 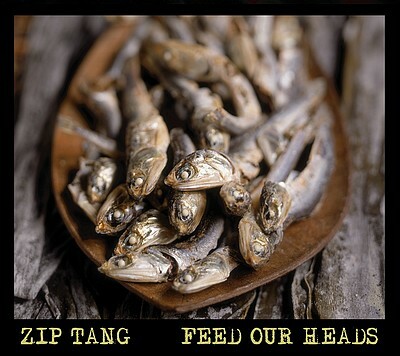 Just Plain Folks - a grass-roots music organization that hosts the world's largest independent music awards has nominated Zip Tang in 4 categories! We've been busy at ZiTi Studio for the last several months writing and developing a bunch of new stuff for our first concept album. 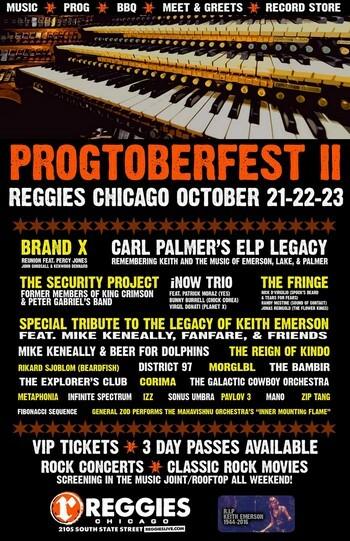 Reggies is proud to announce Progtoberfest II October 21-23, 2016 with 25+ bands playing this year. Our main headliners include the reunion of legendary Jazz/Fusion band Brand X (Percy Jones, John Goodsall, & Kenwood Dennard), The Security Project (former members of King Crimson & Peter Gabriel’s Band), iNow Trio (Patrick Moraz (Yes), Bunny Brunel (Chick Corea), and Virgil Donati (Planet X)), The Fringe (Nick D’Virgilio (Spock’s Beard & Tears For Fears), Randy McStine (Sound of Contact), and Jonas Reingold (The Flower Kings)), and Carl Palmer’s ELP Legacy - Remembering Keith and the Music of Emerson, Lake & Palmer as well as a tribute to the legendary Keith Emerson featuring acclaimed Chicago ELP tribute Fanfare, Jonathan Schang of District 97, Mike Keneally, and other guests. 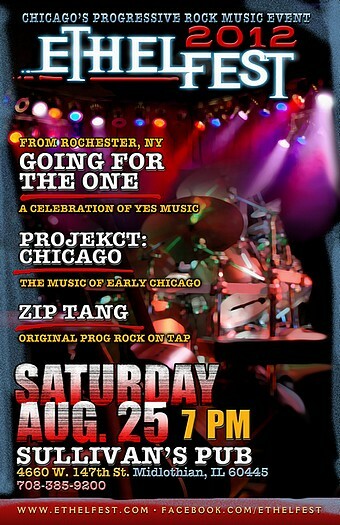 VIP Ticket includes admission to Progtoberfest, Meet & Greet with bands, Poster, and BBQ Buffet. We will be performing our new album "Private Shangri-La" in its entirety with our good friends, headliner Sonus Umbra - featuring their new album "Beyond the Panopticon", and Might Could - "The N.E.S.F.A.N. Trilogy" opening the show. Wire is an exciting new venue with a large stage, great lighting, excellent sound system, and a fantastic beer menu! 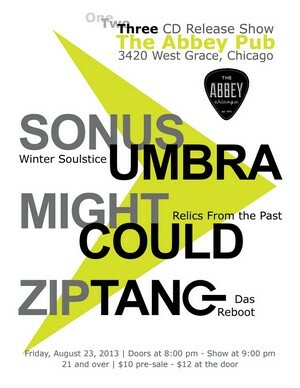 We look forward to rocking this joint with you and some spectacular musicians! with Spock's Beard, Stick Men feat. Tony Levin, Tu feat. Trey Gunn and Pat Mastelotto, and many more great bands! After nearly a dozen years as a quartet, Zip Tang is now a trio. We want to express our best wishes to Marcus Padgett and our gratitude for 12 great years together as an integral part of Zip Tang. We wish him all the best on the next phase of his musical journey. 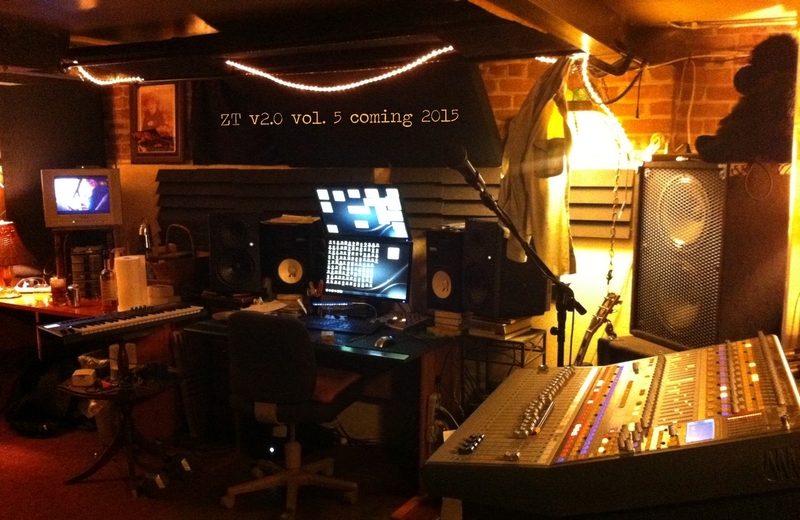 Zip Tang 2.0 will live on and we are very excited about the new material the three of us have been working on for the last several months, and the somewhat new direction the music has taken. at iTunes, Rhpasody and CD Baby! Album #4 is nearing completion friends. Stay tuned here or on our Facebook page for updates and release date. "Feed Our Heads" CD Release Show! District 97 - with 2007 American Idol Top 10 Female Finalist, Leslie Hunt on lead vocals! "FOH" is available now at iTunes . to buy or download at CD Baby! Coming soon to iTunes. Hard to believe we released PANK over a year ago and reviews still coming from around the world. New reviews from Norway, Brazil, New Zealand and Germany. Zip Tang has been selected to play at the JPF Pre Awards Nominee Showcase at BB Kings Nashville Aug. 28th. JPF reports that their 8000 volunteer judges screened over 42,000 CD's and 560,000 songs to reach these final results in 80 categories. Check it out! The final voting is next and the Awards will be announced August 29 in Nashville! We'd like to thank the judges that voted for us and wish good luck to the other nominees. Maybe we'll see some of you in Nashville. 44. Nick Cave & The Bad Seeds - Dig! Lazarus, Dig!!! Lazarus, Dig! 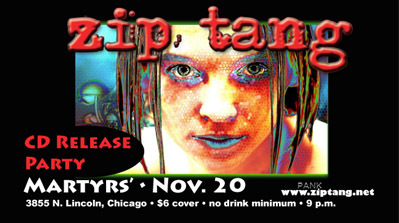 PANK CD Release Party at Martyrs' Nov. 20th at 9:00pm, door at 8:30. 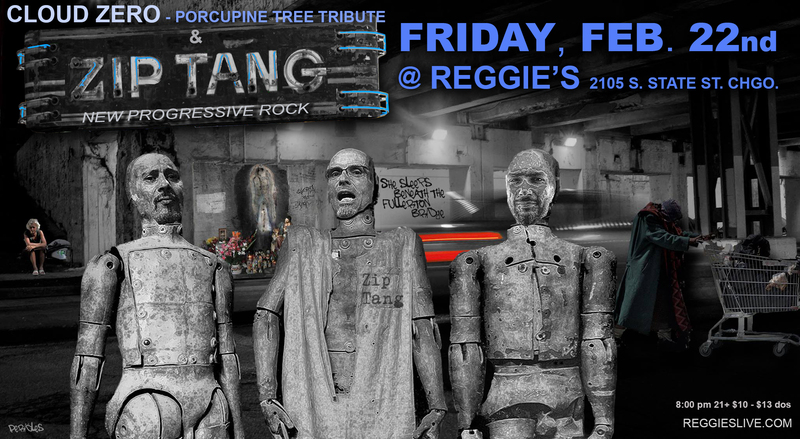 Attention all Zip Tang fans! As you may know, our drummer's son plays bass for The Hush Sound. On July 20, in the midst of their "Dance Across the Country" tour, THS will be headlining at The House of Blues. In a daring display of Cross Generational Musical Pollination, Zip Tang will perform a short opening set with a little help from their young friends. This is a Very Special Onetime Performance that must be seen to be believed. Tickets are available at The House of Blues. Don't be alarmed that ZT does not appear on the marquis – we'll be there. It's a secret show for our special fans! 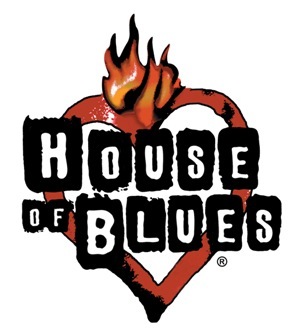 The last time THS headlined at the House of Blues it sold out so get your tickets NOW!